These cards aren't just beautiful, but practical as well. There is room on the front for up to 14 ingredients so they are perfect for your longest recipes. Fits nicely in recipe binder sleeves. Our stylish recipe cards have plenty of room to fit your entire recipe. Black and white art deco cards are printed in the USA on heavy acid free cardstock. These cards are a beautiful way to share your favorite recipes with family and friends. Wonderful housewarming or wedding gift. 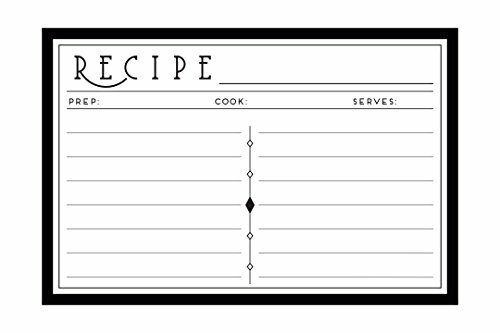 4x6 DOUBLE SIDED RECIPE CARDS with classic Art Deco design. Designed and printed in the USA on heavy acid free cardstock. Packaged in a sturdy protective box. Ready for gift giving. Perfect for your own recipe box or recipe binder or to give as a housewarming or bridal shower gift. If you have any questions about this product by Pacific Home, contact us by completing and submitting the form below. If you are looking for a specif part number, please include it with your message.